Jesus told us when his coming “in like manner” was to be! In the three previous articles, #1, #2, #3, we clearly established that the ascension of Jesus did not point to or emphasize the return of a 5’5” Jewish man in his flesh and blood body, but to the glorious return of the covenant-presence of Jehovah to his people. Jesus, being one with the Father, was to return in (1) the clouds, (2) in glory, and (3) with blessing (salvation), which would be in “just the same way” that the disciples had seen him go. -The disciples saw Jesus ascend in the glory-cloud while blessing them. -But, Jesus was to return in “just the same way” as they has seen him go. -Therefore, Jesus must return in the glory-cloud, and with blessing. -But, the New Testament teaches that Jesus would return in the glory-cloud, and with blessing (salvation) in the lifetime of the first century disciples. -Therefore, Jesus returned (his second coming) in the lifetime of his first century disciples, in “just the same way” as he ascended, in fulfillment of Acts 1:9-11. Below is the emphatic testimony of inspired scripture that the second coming of Jesus in the cloud, in glory, and with blessing – in fulfillment of Acts 1:9-11 – was to be accomplished in the lifetime of the first century disciples. The writer of Hebrews connects the “blessing” (salvation) with the second coming (second appearing) of Jesus. Notice…. So Christ also, having been offered once to bear the sins of many, will appear a second time for salvation without reference to sin, to those who eagerly await Him. And Jesus limits that second appearing (his second coming) – in the “clouds” and in “glory” – to the lifetime of his first century disciples. Notice…. For the Son of Man is going to come in the glory of His Father with His angels, and will then repay every man according to his deeds. Truly I say to you, there are some of those who are standing here who will not taste death until they see the Son of Man coming in His kingdom. And then the sign of the Son of Man will appear in the sky, and then all the tribes of the earth will mourn, and they will see the Son of Man coming on the clouds of the sky with power and great glory…. Truly I say to you, this generation will not pass away until all these things take place. Then they will see the Son of Man coming in clouds with great power and glory…. Truly I say to you, this generation will not pass away until all these things take place. Then they will see the Son of Man coming in a cloud with power and great glory. But when these things begin to take place, straighten up and lift up your heads, because your redemption is drawing near…. Truly I say to you, this generation will not pass away until all things take place. For this we say to you by the word of the Lord, that we who are alive and remain until the coming of the Lord, will not precede those who have fallen asleep. For the Lord Himself will descend from heaven with a shout, with the voice of the archangel and with the trumpet of God, and the dead in Christ will rise first. Then we who are alive and remain will be caught up together with them in the clouds to meet the Lord in the air, and so we shall always be with the Lord…. 5:8 But since we are of the day, let us be sober, having put on the breastplate of faith and love, and as a helmet, the hope of salvation. For God has not destined us for wrath, but for obtaining salvation through our Lord Jesus Christ. The Revelation of Jesus Christ, which God gave to him to show to his bond-servants the things which must soon take place…. Behold he is coming with the clouds, and every eye will see Him, even those who pierced Him; and all the tribes of the earth will mourn over Him. So it is to be. Amen…. 22:7 And behold, I am coming quickly. Blessed is he who heeds the words of the prophecy of this book.”…. And he said to me, “Do not seal up the words of the prophecy of this book, for the time is near…. Behold, I am coming quickly, and My reward is with Me, to render to every man according to what he has done. By combining these texts, we can see that the very same elements – the cloud, the glory, and the blessing (salvation) – that were present at the ascension, were to be present at the return (second coming) of Jesus, which both Paul and Jesus himself limited to the lifetime of the first century disciples. 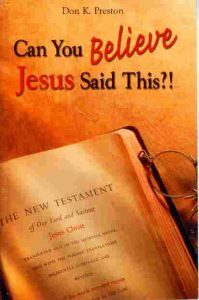 If this has not happened – if the second coming is yet future – then the scriptures are not inspired, and worse, they are false and need to be rejected as the word of God. One more thought before we conclude. Since the imagery and language in Acts 1:9-11, Luke 24:49-51 (in the context of Pentecost) convey the idea that the ascension of Jesus was his returning to his Father in the glory-cloud, to receive and initiate his rightful rule and reign (his Kingdom) over the house of Israel, then logically, his return (his second coming) would be the culmination of those things. In other words, since the ascension initiated both the Kingdom and the construction of the New Testament temple (the restored house of Israel as the Church), then the second coming – which would be in “just the same way” – would be its consummation, its completion and full establishment. What we need to understand is that the second coming of Jesus in the glory-cloud and with salvation (blessing) – his coming “in like manner” – was for the purpose of consecrating and glorifying the New Covenant temple – the Church – through the arrival of his covenant-presence. Through this, would be the “coming of his Kingdom”. We have two clear examples in the Old Testament of the glory-cloud filling the dwelling of God (both tabernacle and temple) when its construction was “finished”. Notice…. He erected the court all around the tabernacle and the altar, and hung up the veil for the gateway of the court. Thus, Moses finished the work. Then the cloud covered the tent of meeting, and the glory of the Lord filled the tabernacle. Thus, all the work that King Solomon performed in the house of the Lord was finished…. 8:10 It happened that when the priests came from the holy place, the cloud filled the house of the Lord, so that the priests could not stand to minister because of the cloud, for the glory of the Lord filled the house of the Lord. And significantly, in the context of “finishing of the work of the house” and the glory-cloud filling it, both Moses and Solomon – the builders of the house – “blessed” the people. Notice…. And Moses examined all the work and behold, they had done it; just as the Lord had commanded, this they had done. So Moses blessed them. When Solomon had finished praying this entire prayer and supplication to the Lord, he arose from before the altar of the Lord, from kneeling on his knees with his hands spread toward heaven. And he stood and blessed all the assembly of Israel with a loud voice, saying: Blessed be the Lord, who has given rest to His people Israel, according to all that He promised; not one word has failed of all His good promise, which He promised through Moses His servant. Yet, “the work” had not been finished. And because it had not been finished, it had not been glorified; the presence of Jehovah had not yet returned in the “glory-cloud” to fill the temple. This is the imagery that we see in the expectation of the second coming of Jesus in the first century. They were expecting Jesus to return in the cloud, in glory, and with salvation (blessing) within their lifetime. Said another way…. “They were expecting the return of the presence (parousia) of Jehovah to the church – the heavenly Temple – which would glorify the temple and consummate their salvation through the removal of sin, thereby fully establishing the Kingdom of God. -The phrase “in just the same way” (hos tropos / in like manner) in Acts 1:11 can’t be pressed to mean “in exactly, specifically, precisely the same way”. The usage of that phrase in comparative texts denies that interpretation. -The emphasis of the ascension of Jesus in Acts 1:9-11 was not on his physical flesh and blood body, but on three covenant-elements found in verse 11 of Acts 1, as well as in comparative texts. Those elements are, the cloud, the glory, and the blessing. -Those specific three elements were prophesied by Jesus and the New Testament writers to be present at the second coming. Jesus was expected to come in the cloud, in glory, and in blessing – “in like manner” as they had seen him ascend. And, both Jesus and his disciples limit the time of his coming – in the cloud, in glory, with blessing – to the lifetime of the first century generation. -Those specific three elements were present when Jehovah glorified both the tabernacle and temple upon their completion – when the “work was finished” – representing his abiding presence in the midst of Israel. -The true and heavenly temple – the Church – was being constructed in the first century, and the saints were awaiting their salvation, their full inheritance. The temple was not yet “finished” prior to AD70. Therefore, the second coming as prophesied in Acts 1:9-11 did not and does not refer to a future to us (2018) visible and bodily return of Jesus, but to the covenant-presence of Jehovah returning to his completed temple – the Church, the body of Christ. If the second coming of Acts 1:9-11 has not yet taken place, then not only are the scriptures uninspired and false, but the Church – God’s temple – is an unfinished (unsaved) entity, to which the presence of God has not returned, and therefore does not dwell. May the Lord give us the courage and understanding to embrace the biblical truth that the second coming of Jesus Christ was accomplished in the first century, through which he now lives, reigns, and abides forever with his covenant people Israel, the Church. He came “in like manner” just as promised!